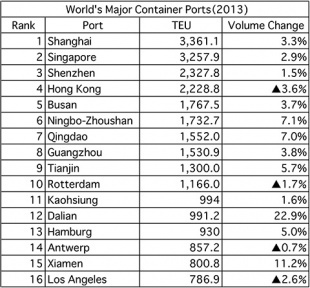 A ranking list of the world’s busiest container ports in 2013 has been made available. 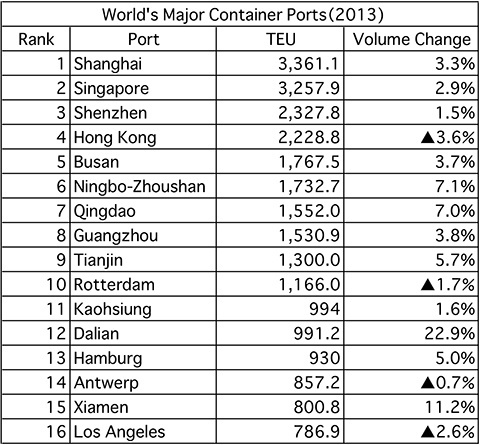 Shanghai and Singapore defended their titles as the busiest and second-busiest ports from a year earlier. Volumes exceeded the 30-million-TEU mark at both ports, totaling 33,610,000 TEUs, up 3.7%, and 32,578,700 TEUs, up 2.9%, respectively. Shenzhen, China processed 23,278,000 TEUs, up 1.46%, stepping up from fourth to third place. In contrast, Hong Kong went down from fourth to third place, as container throughput was sluggish due to the labor strike at the Kwai Tsing Container Terminal and the intensification of competition among ports in South China, falling 3.6% to 22,288,000 TEUs. Busan, South Korea came in fifth, to and from which 17,675,000 TEUs were transported, up 3.7%, which was the largest growth among the top five. Looking at leading container ports more closely, those in China enjoyed year-on-year improvements in throughput across the board, but those in Europe did not, as the European economy did not recover as powerfully as expected. For example, container volumes diminished at Rotterdam, the Netherlands and Antwerp, Belgium, down 1.7% to 11,660,000 TEUs and down 0.7% to 8,572,345 TEUs. Containerized shipments to and from the U.S. port of Los Angeles were not robust, either, decreasing 2.6% to 7,868,582 TEUs.